Copyright: © 2017 Federico B, et al. This is an open access article distributed under the Creative Commons Attribution License, which permits unrestricted use, distribution, and reproduction in any medium, provided the original work is properly cited. Introduction: Congestive heart failure is one of the main causes of morbidity and mortality in the XXI century given the promising to date of ABMDSCs and HFDSCs we investigate the safety and efficacy for the implantation of those stem cells for the treatment of idiopathic cardiomyopathy. This is the first pilot clinical study to assess the safety and feasibility of HFDSC in humans. We totally implanted 13 patients: 3 patients were implanted with ABMDSC by Mini-invasive surgical technique in March 2004 in Montevideo, Uruguay, and 10 patients were implanted with HFDSCs by using 2 different surgical techniques: minimally invasive technique (1 patient) and full sternotomy technique (9 patients) between January and February of 2005 in Guayaquil Ecuador. The HFDSCs were obtained from fetuses of 5 to 12 weeks´ gestation from legally consent, no compensated donors who have undergone terminated ectopic pregnancies, elective abortions, or spontaneous miscarriages. At that gestation´s period, totipotent stem cells´ fetus haven´t develop yet the HLA histocompatibility complex, so there´s no possible antigenicity between donor and recipient. Results: Patients with HFDSCs improved in association with increased contractility in these regions. Compared with baseline assessments, we noted other improvements: The mean (±SD) NYHA class decreased from 3.4±0.5 to 1.33±0.5 (P=.001); the mean EF increased 31%, from 26.6% ± 4.0% to 34.8%±7.2% (P=.005); performance in the ETT increased 291.3%, from 4.25 minutes to 16.63 minutes (128.9% in metabolic equivalents, 2.45 to 5.63) (P<.0001); the mean LVEDD decreased 15%, from 6.85±0.6cm to 5.80±0.58cm (P<.001); mean performance in the 6-minute walk test increased 43.2%, from 251±113.1 seconds to 360±0 seconds (P=.01); the mean distance increased 64.4%, from 284.4±144.9m to 468.2±89.8m (P=.004); and the mean result in the Minnesota congestive HF test decreased from 71±27.3 to 6±5.9 (P<.001) The Kaplan-Maier probability of survival at 48 months was 66%. It is not observed rejection, these patients have not developed malignance nodules or cancer at all in the follow-up. In the AMBCSs. The preoperative average NYHA functional class was 3.4; at. 6 months of follow up the average functional class value was 1.3 (p<0,005);. After 6 months all of them remained in functional class I/II. Baseline values of LVEF were 25,28 and 30%. ; at 6 months increased to 38, 40 and 46%. (p<0,05). LVESV went from 50mm to 42mm (p<0.05). After 24 months, 2 of the patients still maintained this improvement, while the 3er patient returned to the earlier values after suffering from pneumonia. At 12 years and 5 months 2 patients are alive both received a Resynchronization Therapy; at 8 years and 3 months and 9 years and 1,6 month the actual average EF are 28 and 30 %. The 3er patient died of sudden death at 10 years after the implantation. We can´t demonstrate the cause of this sudden death. Conclusion: Irrespective of the improvement seen in this study, it is still premature to determine accurately the mechanism of action, indications, doses and type of stem cells. Therefore, is imperative and extremely important that more research is needed. Congestive heart failure is one of the main causes of morbidity and mortality in the XXI century [1,2]. Patients in advanced stages (NYHA functional classes III/IV) have an average of 5 year survival rates below 50%, with an annual mortality of 40 to 50% , high rates of re hospitalization and elevated costs for the health services Etiology for dilated cardiomyopathy is 60% due to ischemic cardiomyopathy and 40% of idiopathic-non-ischemic origin. This category of patients have been managed with medical treatment (ACE inhibitors, diuretics, beta-blockers, and Spiro lactone), ventricular re-synchronization, ventricular assistance and heart transplantation. For many years, heart transplantation has been the surgical treatment of choice for patients with advanced heart failure. This procedure has been successful in many countries; however it presents many limitations, the most important ones being the scarcity of donors and the contraindications of advanced age and severe co-morbid situations . Moreover, there have been frequent deaths during the prolonged periods in the waiting list for organ reception. The final stage of several heart diseases ending in congestive heart failure is the quantitative deficiency of cardiomyocytes and cardiac remodeling . Reversion of cardiac remodeling lies in the possibility of myocyte regeneration and neo-vascularization of affected areas. The goal of cellular therapy is the re-population of the myocardium with cells capable of restoring contractility and blood flow: This will improve the systo-diastolic function of the heart. The cells introduced must have the capacity for differentiation into cardiomyocytes or promote revascularization. Several studies have shown that the adult bone marrow is a rich reservoir of these pluri-potential, mesenchymal stem cells, which contribute to functional neo-angiogenesis. They also participate in wound healing and reversion of lower limb ischemia , post-MI neo-angiogenesis [7,8], endothelization of vascular grafts , atherosclerosis , retinal and lymphoid neo-vascularization  and vascularization during neo-natal development . Most cell therapy administered to Heart Failure patients to date has been bone-marrow-derived stem cells (ABMDSCs). Embryo Fetal (HFDSCs) stem cells are thought to be more pluripotent than adult stem cells; for example the former can develop into a wider range of specialized cells . Although HFDSCs have been used to treat a variety conditions, including blood and immune system disorders , spinal cord injuries , stroke , other neurologic and eye disorders , and diabetes , there have been no reports of use of HFDSCs in Heart Failure therapy. Given the promising to date of ABMDSCs and HFDSCs we investigate the safety and efficacy for the implantation of those stem cells for the treatment of idiopathic cardiomyopathy. This is the first pilot clinical study to assess the safety and feasibility of HFDSC in humans. We totally implanted 13 patients: 3 patients were implanted with ABMDSC by Mini-invasive surgical technique in March 2004 in Montevideo, Uruguay, and 10 patients were implanted with HFDSCs by using 2 different surgical techniques: minimally invasive technique (1 patient) and full sternotomy technique (9 patients) between January and February of 2005 in Guayaquil Ecuador. The HFDSCs were obtained from fetuses of 5 to 12 weeks´ gestation from legally consent, no compensated donors who have undergone terminated ectopic pregnancies, elective abortions, or spontaneous miscarriages. At that gestation´s period, totipotent stem cells´ fetus haven´t develop yet the HLA histocompatibility complex, so there´s no possible antigenicity between donor and recipient. This study was performed with the authorization of the Hospital authorities and ethics council; and the patients’ informed consent. The patients presented dilated idiopathic cardiomyopathy with a severe decrease in LVEF and functional capacity. 1. Patients in NYHA functional class III/IV. 2. Dilated, idiopathic, non-ischemic and non-chagasic cardiomyopathy with LVEF <35%. 3. Optimal medical treatment including ACE inhibitors, spironolactone, beta-blockers and diuretics at an average 85% of the maximum dose. 4. Bilirubin, creatinine, blood urea nitrogen, serum glucose, glutamine-oxaloacetic transaminase (aspartate aminotransferase), and glutamic-pyruvic transaminase level <2.5 times normal values. 5. Symptomatic condition despite of optimal drug therapy for HF. 1. Congestive heart failure decompensated in the last 6 days. 2. Cancer present during the last 5 years. 3. Presence of hematological diseases. 4. Leukocyte count above 12000/cc or below 5000/cc. 5. Renal failure requiring hemodialysis. 7. Valvar heart disease requiring surgery. 12. Positivity in Human Immunodeficiency Virus or venereal Disease Research Laboratory testing. 13. Intolerance or hypersensitivity to biological substances. 14. Participation in another clinical trial. 15. Have a history of drug or alcohol abuse. 17. Suicide attempts in the previous 2 years. 18. Renal failure needing dialysis. 19. Pulmonary thromboembolism within the previous 6 months. 20. Mechanical ventilation support within the previous 10 days. Patients who were initially included but who non-compliant with the protocol (tests or treatment), were lost to follow-up, or developed an unrelated new illness were excluded from the study. For each patient, preoperative medications (digoxin, furosemide, spironolactone, angiotensin-converting enzyme inhibitors, angiotensin receptor blockers, beta-blockers) were maintained throughout the study and the follow-up. Patients were taken to the Operating Room monitored, anesthetized and placed in the prone position. Bone marrow (BM) was harvested by hematologists from the iliac crests as is habitually done in the hematology and hemotherapy departments; bilaterally between both posteriors spine. Using this technique we were able to harvest 500 to 600 mL of bone marrow with a minimally number of puncture sites and were placed in a special container with 10000 U of heparin and acetylsalicylate lysine to prevent coagulation. At least 250 mL of bone marrow must be harvested to continue with the protocol. The bone marrow was filter followed by a 200-um filter. The resulting solution was centrifuge at 400g for 15 min. the cellular pellet was re suspended in phosphate-buffered saline (PBS). The cell solution was mixed 3:1 with a solution of 155 moll/L NH4Cl and 0.1 moll/L EDTA and set for 15 min at room temperature. The solution was then centrifuge at 400g for 10 min. The pellet was washed with PBS and re suspended. The cell suspension was placed over Ficoll-Paque (1.077 density) 4:1 and centrifuged at 400g for 30 min. the upper layer was aspirated, leaving the mononuclear cell layer at the interphase. The interphase cell were transferred to a new conical tube with PBS and centrifuged at 300g for 10 min. The supernatant was completed removed, and the cell pellet was re suspended in PBS. Cell counts were performed, and magnetic labeling with Isolex 300i was performed as per standard protocol for peripheral blood progenitor cell products to obtain an enriched product of, at least, 70% CD34+ cells. The resulting cell solution is re suspended in 30 cc of the patient own serum and 10 000 U of heparin sulfate. Cell viability is established with a standard Trypan blue exclusion. Stem Cells HFDSCs were provided by the Institute for Regenerative Medicine, Barbados, and were processed and prepared by the Institute for Problems of Cryobiology and Cry medicine (IPCC) (Kharkov, Ukraine). The IPCC obtains HFDSCs from fetuses of 5 to 12 weeks’ gestation from legally consenting, noncompensated donors who have undergone terminated ectopic pregnancies, elective abortions, or spontaneous miscarriages. The HFDSCs are prepared from harvested fetal liver tissue under sterile conditions and undergo polymerase chain reaction testing for human immunodeficiency virus, hepatitis B and C, mycoplasma, toxoplasmosis, cytomegalovirus, and herpes simplex viruses I and II, rubella, and Treponema pallidum; HFDSCs also undergo culture tests for bacterial and fungal contamination. Cell preparations are stored in cry preservatives at -196°C in liquid nitrogen. The percentage of viable cells before thawing was 60% according to the IPCC certification. The IPCC shipped HFDSCs in minishipper containers in a cryopreserved state (-150°C to -196°C) to Luis Vernazza Hospital in Guayaquil Ecuador for this study, and they were maintained in this state until use. Just before the procedure, HFDSCs were thawed at room temperature. In 9 patients, the cells were diluted in 80mL of saline solution at 37°C; in 1 patient, who underwent the procedure via a mini thoracotomy approach, the cells were diluted in 15mL. Patients received 7.5x105cells/mL and 5.3x106cells/mL, respectively. So in total they received 60-80x106 HFDSCs. 9 patients underwent a midline sternotomy (Figure 1), prior to the injections, 80 marks (1cm apart) were made with a blue methylene marker on the anterolateral, posterolateral, and diaphragmatic left ventricular walls and on the anterolateral right ventricular wall, avoiding coronary blood vessels. We administered 80 injections of 1mL each in the marked areas. The injections were made 3mm deep with a 25-gauge needle and a catheter. During the procedure, patients were monitored for arterial pressure, central venous pressure, urine output, electrocardiogram, oxygen saturation, and end-tidal carbon dioxide concentration in the expired air. Infusions of potassium (20mEq/hour) and magnesium (1 g/hour) were started before the operations and maintained up to the time of chest closure. All patients were extubated in the operating room. Figure 1: Sternotomy Blue marker for the 80 injections. 3 patients received Autologous Bone Marrow Stem Cells and 1 Human Fetal-Derived Stem Cells by this approach. After harvesting the ABMDSCs patient is placed in a right lateral position with a 30° to 45° inclination from the horizontal plane of the right hemi thorax. 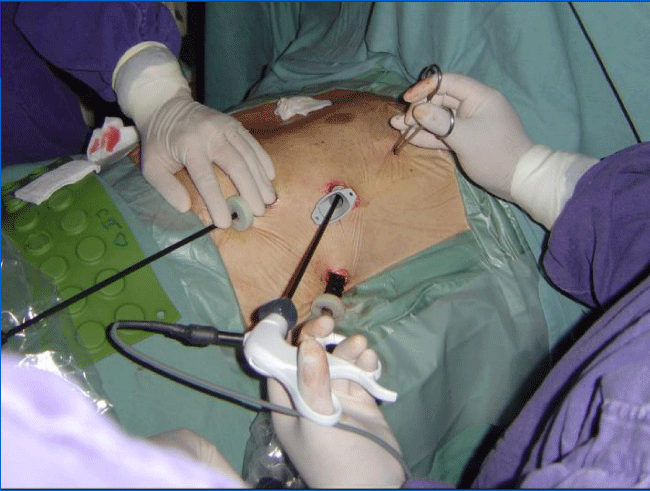 Video-assisted surgery includes positioning of three 10mm trocars in the 3rd, 5th and 7th intercostal spaces: One for the camera and the rests for the instruments. We used a double-lumen ore-tracheal tube in this procedure, and the trocars are introduced once the left lung has been collapse. The camera is inserted posteriorly in the 7th space (Figure 2). Figure 2: Minimally Invasive Approach for Stem Cells Implantation. Exploration begins by opening the pericardium anteriorly to the position of the phrenic nerve. Injection in the selected areas is performed, guided by the preoperative echocardiogram and avoiding intraventricular and intracoronary injection. We deliver aliquots of 1cc separated by 2 to 3cm and 3 to 5mm in depth with a 25G needle with an average of 25 injections in the ABMSCs patients (Figure 3). Only 15 injections were made in the anterolateral wall in the patient who underwent HFDSCs. 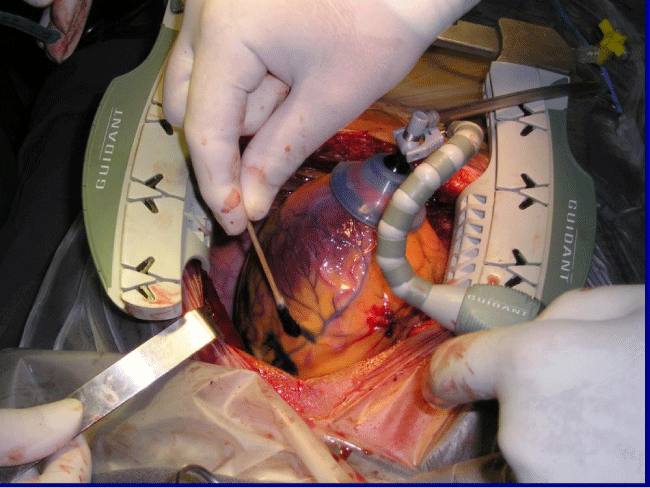 Figure 3: Stem Cells Injection in the Heart by Minimally Invasive Approach. 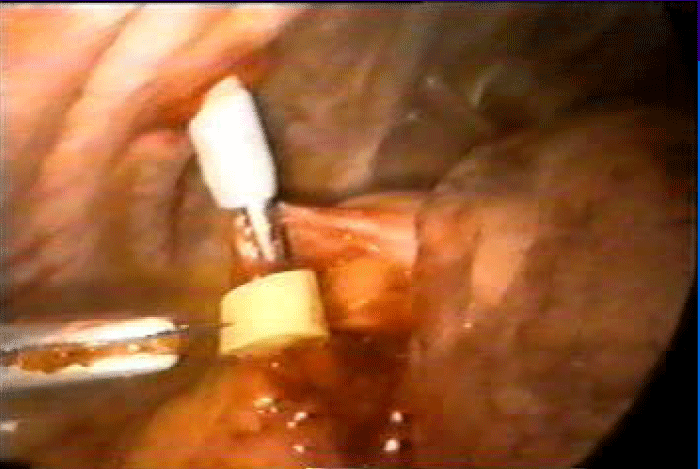 The procedure is completed when trocars are withdrawn and the thoracic tube is put in place. Finally, the 4 patients were extubated and leave the OR. Follow-up are conducted by clinical examination, EKG, X-ray films and echocardiogram at 48 months Results were analyzed by independent cardiologists, not involved in this study. Statistical analysis applied the student test (SPSS program), with p<0.05 were considered significant. 6 female and 4 male patients (age range, 47-77 average 58 years) met the inclusion criteria and participated in the study. 9 of those received HFDSCs by sternotomy and 1 minimally invasive left approach. There was not operative or perioperative mortality. One male patient (U.J., 69 years) experienced a single transient intraoperative ventricular fibrillation during the procedure but before receiving injections; the ventricular fibrillation was terminated by electrical cardioversion. One man (M.J., 66 years) and 1 woman (V.M., 77 years) required temporary pacemakers postoperatively because of severe bradycardia (<40 bpm), for 24 hours and 48 hours, respectively. The former patient received dobutamine for 24 hours. He also had a mild pericardial effusion at 3 weeks, which resolved spontaneously. He was later excluded from the trial for noncompliance (he abandoned his controls), and he ultimately died at 5 months. The heart autopsy showed nests of cardiomyocytes among the fibrotic tissue, (Figure 4), but it was not possible to determine whether they were new growing myocardium or remaining native fibers .One female patient died suddenly at 8 months by severe gastroenteritis complications; the female patient who underwent her procedure via minimally invasive died at 12 months from Heart Failure caused by mitral insufficiency. She had refused a mitral valve operation; another female patient died at 18 months for diabetes complications. The HFDSCs patients who provided 48 months of follow-up data demonstrated improvements both clinically and in imaging studies. With regard to the imaging studies, we noted an increased wall thickness, both eccentric and concentric; patients improved contractility in these regions. 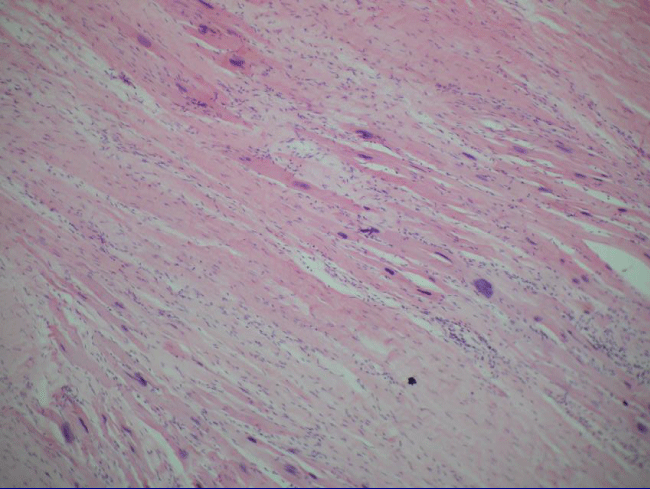 Figure 4: The heart autopsy showed nests of cardiomyocytes among the fibrotic tissue. Compared with baseline assessments, we noted other improvements: The mean (±SD) NYHA class decreased from 3.4±0.5 to 1.33±.5 (P=0.001); the mean EF increased 31%, from 26.6%±4.0% to 34.8%±7.2% (P=0.005); performance in the ETT increased 291.3%, from 4.25 minutes to 16.63 minutes (128.9% in metabolic equivalents, 2.45 to 5.63) (P<0.0001); the mean LVEDD decreased 15%, from 6.85±0.6cm to 5.80±0.58cm (P<.001); mean performance in the 6-minute walk test increased 43.2%, from 251±113.1 seconds to 360±0 seconds (P=0.01); the mean distance increased 64.4%, from 284.4±144.9m to 468.2±89.8m (P=0.004); and the mean result in the Minnesota congestive HF test decreased from 71±27.3 to 6±5.9 (P<0.001) The Kaplan-Maier probability of survival at 48 months was 66%. It was not observed rejection; these patents have not developed malignance nodules or cancer at all in the follow-up. The controls were stooped at 48 months One patient died at 11 years due Heart Failure One patient was alive and asymptomatic at 12 years , the rest were lost in the follow up. 3 patients, 2 males and 1 woman (age range 62-71 average 67.6 years), fulfilled inclusion criteria and received autologous stem cells by minimally invasive left approach. All patients were extubated in the OR. The pleural tube was withdrawn after 24hrs and they were discharged after an average of 2.26 days. No complications were observed they received an average of 54X106 /mL CD34+ cells. The preoperative average NYHA functional class was 3.4; at. 6 months of follow up the average functional class value was 1.3 (p<0,005); after 6 months all of them remained in functional class I/II. Baseline values of LVEF were 25, 28 and 30 %. ; At 6 months increased to 38, 40 and 46% (p<0.05). LVESV went from 50mm to 42mm (p<0.05). After 24 months, 2 of the patients still maintained this improvement, while the 3er patient returned to the earlier values after suffering from pneumonia. At 12 years and 5 months 2 patients are alive both received a Resynchronization Therapy; at 8 years and 3 months and 9 years and 1, 6 month the actual average EF are 28 and 30 %. The 3er patient died of sudden death at 10 years after the implantation. We can´t demonstrate the cause of this sudden death. Stem cells treatments depend not only in the type of cell to be used but also on the way of approaching the target organ or tissue. It is known that intravascular injections of cells rapidly clear from the target vessel. On the other hand it is also well known that the direct injection into the myocardium provides better engagement within the cardiac muscle. Therefore, either in case of HFDSC or ABMSC we focused in direct approaches. When we have to deal with different stimuli, such as parietal stress or direct myocardial injury leading to hemodynamic overload, the heart responds with hypertrophy, capable of initially compensating loss of function. Later on, and for a long sub-clinical period, progressive dilatation continues to be compensated by varying degrees of hypertrophy. At the final stage, as described by Meerson et al , dilatation exceeds hypertrophy and changes in cellular organization appear, such as: 1) Myofibrillar lysis; 2) Increase in lysosomes; 3) Distortion of the sarcoplasmic reticulum; 4) substitution of myocardial cells by fibrous tissue. Simultaneously, capillary density and contractile reserve decrease, and diffuse myocyte necrosis is a feature of both idiopathic and ischemic dilated cardiomyopathy [20,21]. Therefore, idiopathic dilated cardiomyopathy can be described from a pathologic point of view , as a dilated heart with hypertrophied walls; macroscopically dilatation exceeds hypertrophy. Microscopically the heart appears invaded by areas of interstitial and perivascular fibrosis, adjacent to necrotic areas and myocytes which may be atrophic or hypertrophic, with loss of the extracellular matrix. Cellular therapy in these patients is directed to restore and repopulate the myocardium, and thus recover the lost function by the delivery of cells that are able to differentiate into myocardial cells. The use of mesenchymal or stromal cells as precursors of non-hemopoietic tissues was attempted for the first time by the German pathologist Conheim in 1867 . It was later shown in tissue cultures that they were capable of forming diverse tissues, such as bone, cartilage, muscle, ligaments, tendons, etc [23,24], and of intervening in tissue repair . An extremely interesting study showed that stromal stem cells treated with 5 Azacytidine and injected with the cardiomyocytes interconnected with the latter after one week, forming micro-tubule. ;after 2 weeks they start beating and this contraction becomes synchronous after three weeks they develop natriuretic peptide and are stained with antibodies against actin and myosin, and present an action potential of cardiac cells . The trans-differentiation into the cardiac phenotype requires an adequate microenvironment. Dependence on cellular interconnection by generating cardiac transcription factors (GATA-4 and myocyte factor 2 was also observed) . This also was confirmed by other researchers, stressing the importance of cardiomyocyte intercellular integration with trans-differentiated cells . Among the various cell types studied, stromal stem cells were shown to present the capacity for differentiation into muscular and vascular cells, and for producing neo-vascularization. The first reported case of AMBSCs cells applied to a patient was by Weisel and Lee of Toronto University in 1999 . The differentiation into myogenic lineage with development of actin, myosin and tropomyosin was proved, as well as the presence of Conectin 43, a protein responsible of cellular inter-connection. 1. Fusion and Tran’s differentiation: Fusion with local cells has been ruled out; and the attractive concept of stem cells trans-differentiating and crossing the barrier has still to be demonstrated. Perhaps the correct anatomical mechanism will be clarified when cell therapy can be used as a bridge for heart transplantation and biopsies can be performed. 2. Cardiac stem cell mobilization: Another theory proposes that the implanted cells mobilize specific cardiac stem cells lodged in the muscle that are capable of cardiac regeneration. 3. Angiogenesis: The implanted cells induce significant angiogenesis; according to some, this would be the main mechanism involved. 4. Extracellular matrix: In heart failure there is a net loss of myocytes plus a loss of matrix architecture, which leads to dilatation. The implanted cells could stabilize the latter, preventing dilatation and balancing generation/degradation enzymes. This is the mechanism thought to cause Chagas disease . Clinical application of this treatment was started in 2000, and cases have increased throughout the world. Our study on cases of idiopathic dilated cardiomyopathy shows this is a feasible procedure that have not surgical or immediately postoperative mortality. This technique has shown extremely good results in prospective, randomized studies in ischemic patients, taken to the OR for myocardial revascularization: Marked improvement was observed in ventricular ejection fraction and functional class in those receiving stem cells compared with those submitted to revascularization alone [30,31]. Clinical benefits were evident in improvement of functional class, and no negative effects could be seen. Patients receiving autologous cell therapy obtained a significant increase in LV ejection fraction immediately and improve the clinical condition. We recognize that the relatively small number of patients may represent a significant limitation of this study. These initial findings suggest, however, that HFDSC transplantation improves cardiac function in Heart Failure patients due to idiopathic cardiomyopathy. No rejection reactions or malignancy has been seen at 48 months . We believe that the sustained effect of HFDSC therapy indicates that it offers another possibility for treating patients with advanced Heart Failure and represents a new approach that could be used before other major surgical treatments, including heart transplantation, by having them available “on the shelf,”: thereby avoiding the time-consuming procedures of autologous bone marrow harvesting and processing. Irrespective of the improvement seen in this study, it is still premature to determine accurately the mechanism of action, indications, and doses. Therefore, is imperative and extremely important that more research is needed. Data were analyzed with the Statistical Package for Social Sciences (SPSS, Version 15.0). Remme WJ, Swedberg K. (co-chairman) Task force for the diagnosis and treatment of chronic heart failure, European Society of Cardiology. Guidelines for the diagnosis and treatment of chronic heart failure. European Heart Journal. 2001; 22: 1527-1560. ColucciW, Braunwald E. Patophysiology of Heart Failure, en Heart Disease de Braunwald. 5a Edición. 1997; 360-393. Enrique V. Carbajal, MD, Prakash C. Deedwani A. Current Diagnosis and Treatment is Cardiology 2nd Ed. Congestive Heart Failure. 2003; 18. O´Donoghue K, Fisk NM. Fetal stem cells. Best Practice residential clinical Obstetric-Gynecologist. 2004; 18: 853-875. Tsymbalyuk VI, Yaminsky YY. Usage of embryonic nerve tissue transplantation to improve the conductivity of spinal cord after traumatic damage in animals and humans. Transplant ology. 2003; 4: 199-201. Zorin MO, Yurchenko TN, Latyshev DY. Application of cryopreserved suspension of embryonic neural cells in combined treatment of patients with ischemic insults of basal ganglia. Transplant ology. 2003; 4: 149-150. Salogub TV. Perspective of embryonic cell transplantation when treating patients wth epileptiform neuralgia of peripheral genesis. Transplant ology. 2003; 4: 184-185. Grischenko VI, Bobirova LE, Dvornek IL, Bovirova VM. Use of biotechnology in treatment of type I diabetes. Transplant ology. 2003; 4: 16-19. Colucci WS, Braunwald E. Pathophysiology of heart failure in Braunwald¨s Heart Disease 5th edition Saunders company 1997. Benetti F, Viña RF, Patel AN. OPCABG plus simultaneous autologous stem cells implants. 2003.